A second article from the NY Times Affordable Europe feature on Sunday, April 22 provides an overview of the amazing works of art available throughout Rome for absolutely free. For example, the church of Santa Maria Sopra Minerva, next to the Pantheon, houses a sculpture of Christ by Michelangelo. IT is hard to advise a visitor in Rome to skip the Sistine Chapel just because tickets cost $17 or that the line can last for hours. At the same time, in no other city can one wander, with completely empty pockets, and see at least nine works by various Michelangelos — among them the Pietà by the more famous Michelangelo and a number of sly paintings by the only slightly less renowned one, better known as Caravaggio. This free Michelangelo tour takes less than a day. And except for crowds at St. Peters Basilica, which houses the Pietà, you would probably never even see a line. In history, culture and art , Rome's greatness — and curse — is overabundance. The curse is that a visitor can never see more than a fraction of what's there in one visit. Part of the greatness is that there is just so much, you can enjoy a first-rate cultural experience and never pay a cent. “Good Lord, it's beautiful,” he said as he poked his head into the Basilica of San Clemente , a small treasure near the Colosseum that defies any easy description. The spot has been inhabited for some 22 centuries, and visitors can see the layers rising from buildings destroyed in the fire of Nero's time to an old temple to a Persian religion that made it to Rome, Mithraism, to the Christian church built on top as if to physically dominate it. The apse's 12th-century mosaics are stunning, in marble, gold and tile, with birds and deer embellishing religious themes. Then there are more than eight centuries of frescoes, interesting on their own, but to connoisseurs like Mr. Tarquini, tantalizing as a document of the evolution of art. “It's all of history,” Mr. Tarquini said. It is speculated — but never proven — that the 15th-century artist Masaccio, a transitional figure from decorative Gothic to more humanistic Renaissance painting, had a hand in some of the figures otherwise painted by his friend Masolino. Basilica of San Clemente, Via Labicana 95; (39-06) 77-40-021. Open daily 9 a.m. to 12:30 p.m., then 3 to 6 p.m.
Basilica of St. Peter's in Chains, Piazza San Pietro in Vincoli 4a. Open daily 7 a.m. to 12 p.m., then 3:30 to 6 p.m.
St. Peter's Basilica. Open 7 a.m. to 7 p.m. April through September. The rest of the year it closes at 5:30 p.m.
San Luigi dei Francesi, Piazza San Luigi dei Francesi, is near Piazza Navona, as is the Church of Sant'Agostino. Santa Maria del Popolo is at the northern end of Piazza del Popolo. National Museum of the XXI Century Arts (Maxxi), Via Guido Reni 2f; (30-06) 321-0181. Open every day but Monday, 11 a.m. to 7 p.m.
Rome Auditorium, Viale Pietro de Coubertin 30; (39-06) 8024-1281. Monitor Gallery, Viale della Mura Aurelie 19; (39-06) 3937-8024. Tuesday through Saturday, 3:30 to 8 p.m.
Valentina Bonomo Gallery, Via del Portico D'Ottavia 13; (39-06) 683-2766. Monday through Saturday from 3:30 to 7:30 p.m.
Incontri Internazionali d'Arte, Palazzo Taverna, Via di Monte Giordano 36; (39-06) 6880-4009. Open Monday through Friday from 10 a.m. to 2 p.m.
A useful clearinghouse for cultural events — free and not — is the weekly magazine, Roma C'è. It is available at any newsstand for 1.20 euros (about $1.60, at 1.36 to the dollar) or on the Web at www.romace.it. The English language section contains extensive lists of concerts, blues nights, dance, film and exhibitions. Today's NY Times features ways to do Europe more affordably. They highlight Naples as a great alternative to the crowds and cost of Rome. The Naples portion of the article is provided below. The full piece is available here. The picture to the left is of a young crowd congregating in the Piazza Santa Maria La Nova for a late-night drink in Naples. Rome is being invaded — not by soldiers, but by “Da Vinci Code” tours and outrageously expensive cafes. For a far cheaper bite of the Italian dolce vita, go to seaside Naples. Long associated with organized crime, chaotic traffic and a volcano (Vesuvius), Naples is more rough-edged than the Eternal City. But Naples has calmed down and cleaned up just enough to attract the bohemian set, thanks to a dynamic mayor who is promoting the arts, from subway installations by Sol LeWitt to the new Palazzo delle Arti Napoli. Mixing things up are private art spaces like 404 Gallery and Not Gallery , as well as the Hotel Correra 241 (Via Correra 241; 39-081-195-62-842), a 10-room boutique hotel with rotating art exhibits. Doubles start at 75 euros. The food in Naples isn't bad, either. After all, there are a mind-boggling 12,000 pizzerias in town. You can't go wrong with Pizzeria di Matteo (94 Via Tribunali; 39-081-455-262) and L'Antica Pizzeria da Michele dal 1870 (Via Cesare Sersale 1/3; 39-081-553-9204), which serve two types of fresh pies (marinara or margherita) with perfectly thin crusts for about 4 euros. A new show in the southern Adriatic coastal city of Barletta celebrates the art of Italian painter Federico Zandomeneghi, arguably Italy's only true Impressionist painter. The exhibit combines a display of his work, together with two of his famous contemporaries, Pierre-Auguste Renoir and Giuseppe De Nittis, looking at their similarities and differences. His painting La Promenade is featured at left. I was balanced on a scaffold staring into King Solomon’s face, at cracked plaster and peeling paint, close enough to touch the 15th-century fresco, though I wouldn’t have dared. The restorers, who were cleaning and retouching it, were taking a lunch break; the smell of olive oil commingled with those of paint and chemicals. They offered me a sandwich, but I declined, too enthralled by the images to have much of an appetite. I made a promise to myself, that one day I would return to Arezzo and the church of San Francesco, to see if they had succeeded in rescuing Piero della Francesca’s Legend of the True Cross. Other places to visit in Arezzo include the National Museum of Medieval and Modern Art, the Church of San Francesca, the Arezzo Duomo and the Museo Madonna del Parto. Two places to stay are the Relais La Commenda in Anghiari and Il Falconiere in Cortona. You can get a good meal at Da Ventura in Sansepolcro. The Feb. 12 issue of Time includes a story about the search for Leonardo da Vinci's The Battle of Anghiari by Maurizio Seracini. 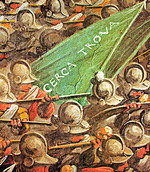 The famously long lost mural is suspected by Seracini to be buried in the Sala del Gran Consiglio in Florence's Palazzo Vecchio. Following decades of delays, dating since the 1960s, the Uffizi Gallery is finally undergoing an expansion. The gallery, which is home to one of the greatest art collections in the world, will stay open during the construction activity. The aim is to keep the artworks and visitors as little affected as possible, with workmen, equipment and a crane shielded from view behind a screen. The expansion will double the building's 6,000 square metres of display space to 12,000, enabling hundreds of works, currently in storage, to be displayed. More than 2,000 art works will be displayed compared to 1,200 at present. The Uffizi will also be able to double the number of visitors admitted daily, from 4,000 to 8,000. The work will be carried out in three phases, with the first phase to last around four and a half years. The work during this phase will focus on the first floor being converted into an exhibition space, the ground floor being changed to offices and a photo archive, and the construction of one of two new stairwells. The gallery's electrical and plumbing systems will also be updated, roof repairs will be tackled and the facade will be cleaned up. The second phase, and apparently the most controversial, will last two years and will feature a loggia designed by Japanese architect Arata Isozaki. Plans for the final stage are still being completed but are expected to take until 2013 to complete. The Uffizi, as you likely know, is one of the most famous museums of paintings and sculpture in the world. It has an amazing collection of Primitive and Renaissance masterpieces from some of the most acclaimed artists of all time, including Giotto, Fra Angelico, Filippo Lippi, Botticelli, Correggio, Leonardo da Vinci, Raphael, Michelangelo and Caravaggio. Of particular note are Botticelli's Primavera and The Birth of Venus. There is also a good representation of German, Dutch and Flemish masters such as Dürer, Rembrandt and Rubens. A great site to visit to see all of the artwork online and get background information on all of the artists is Virtual Uffizi. It occupies the top floor of a large U-shaped building built between 1560 and 1580 by Giorgio Vasari to house the administrative offices (or uffici in Italian, hence Uffizi) of the Tuscan State. The Gallery was created by Grand-duke Francesco I and subsequently enriched by various members of the Medici family, who were great collectors of paintings, sculpture and works of art. The collection was rearranged and enlarged by the Lorraine Grand-dukes, who succeeded the Medici, and finally by the Italian State. 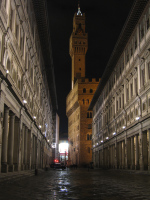 For more information about the Uffizi, click here.